I came to New York Monday to support my play,”The Final Version,” a work that touches upon the on again off again relationship between the white and black New York left from the 1930s to the 1965. My director, Rome Neal, directed five of Amiri Baraka‘s plays throughout the years, yet the obituaries, some of them mean-spirited and ignorant, confine the playwright’s creative output to 1964, when he wrote “Dutchman.” So why do the obituaries say that Baraka was through after 1964, even though he continued to write plays, poetry and publish books around the world? I published two of his books, “Sidney Poet Heroical,” a devastating satire about black Hollywood and “Un Poco Low Coup,” a book of his cartoons. Baraka’s work is considered “short lived” by some because he exposed the attitude of the mainstream toward black writers, that no matter how technically adept you may be with craft, it’s what you say that counts. What he said offended the members of what he would call “the ruling class.” He used his talent to write scathing indictments of racism and the capitalist system. The Black Arts Movement, which he founded with poet Askia Touré and the late Larry Neal, was considered “short lived” because the media rely upon scouts to tell them what’s happening among blacks as though they were members of a nation that has its own ambassadors,whom the media rely upon to tell them what the drums they hear mean. Like the proletariat arts movement of the 1930s, the establishment wishes that the Black Arts movement would just get lost. Though I get associated with the movement, I was living in Chelsea at the time, writing my first novel, a sci-fi surrealist take on what I had experienced in Newark as a twenty something editor of a newspaper there. I had problems with some of its actors. So did Amiri. But this movement did more to expand a black readership than its critics. Amiri Baraka and I clashed. Often. He once called me a “jet plane flying lying n—–.” My response was that when Amiri, a communist, gave up his American Express card, I’d start riding the bus. We set a standard for young people with our arguments. They were conducted by using poetry and wit. Not once was an AK-47 employed. But as the years went by, we found ourselves members of the curmudgeon club. In fact, one of his final essays about corruption in Newark appears in the latest issue of my magazine, Konch. His comments about “Django Unchained” will appear in a forthcoming anthology that I have edited about film. Our final correspondence took place on Nov.17. One obituary called Baraka “polarizing,” which means that he contributed to something they market called “The Racial Divide,” when many of his patrons and supporters were white. Many Europeans are white, and they treated him as they would treat a great writer. Broadway with its parade of black servants, prostitutes, and black bogeymen wouldn’t stage his post “Dutchman” plays, but a musical for which he wrote the book was staged in Paris a few years ago. Even though the obituaries refer to him as an antisemite because of the controversy around his poem “Somebody Blew Up America,” he has two brilliant daughters whose mother is Jewish, the author Hettie Cohen. When I participated in a writers conference held in Israel a few years ago, the organizer expressed regrets that Baraka couldn’t attend. All of his children are achievers including Ras, who is a Newark councilman. His daughter Dominique, whom he had with the great poet Diane Di Prima, is a first rate television host. His beautiful partner Amina Baraka is a poet in her own right. Amiri Baraka was controversial because his was a perspective that was considered out of fashion during this post race ghost dance, the attitude that says that because we have a black president, racism is no longer an issue, when the acrimonious near psychotic reaction to his election only shows the depth of it. In one of two books of mine that were published in Montreal, I argue that Barack Obama is not a Muslim. He’s more like the catholic priest in “The Exorcist.” Drawing all of the demons of American racism to the surface. Was Amiri Baraka an agit-prop writer? What was left out of the indolent obituaries that I read was that he was a two-time American Book Award winner. Baraka’s artistic peers thought enough of his talent to admit him to the exclusive The American Academy of Arts and Letters. Maybe they recognized that Amiri Baraka was the kind of writer who comes along once in a generation or so. I once said that he did for the English syntax what Monk did with the chord. He was an original. 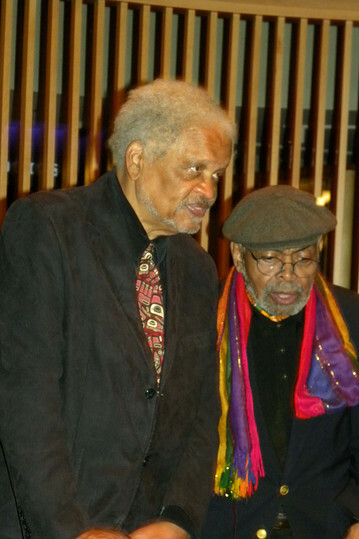 Ishmael Reed’s play,”The Final Version” is on this weekend at the Nuyorican Poet’s Cafe. (212-780-9386). It closes next week. Newer Posttruly a Gathering of the Tribes!